Seam from the bottom corners until the coloured dots, make a strap and go shopping! See – easy as pie! Depending on the length of the piece of fabric you can push the top corners a bit closer to each other, thus making the opening smaller like I did. This entry was posted in Free patterns and tagged bag, crochet, Easy as pie. Bookmark the permalink. thank you, just tried it out with piece of paper, dots and all:D.
Just tried out the folding with a piece of paper and it suddenly came together. Now off to raid the stash and start crocheting! It is so simple but the folds make it so stylish. Hope I can find colours as vibrant as your version. Thanks!! At present I am into making bags both crochet and sewing. I like your bag very much. 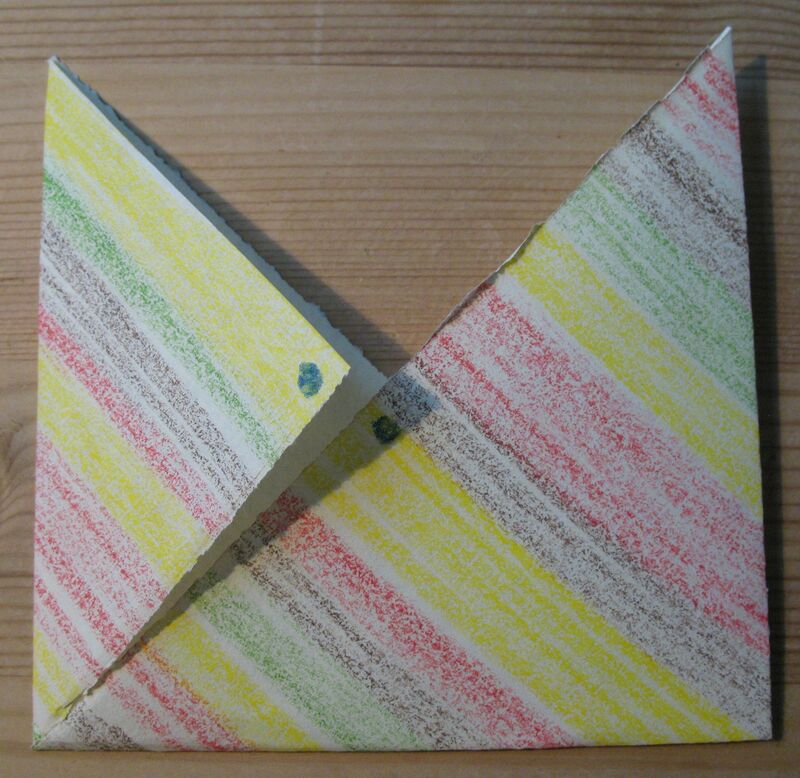 I tried folding it on a paper and it was so easy. Now I will make both a crocheted bag and a stitched bag. Hope to finish it soon and post pictures on Raverly and Crochetvile. Thank you for telling us how to fold the bag and sharing the pattern. Your bag is absolutely stunning. 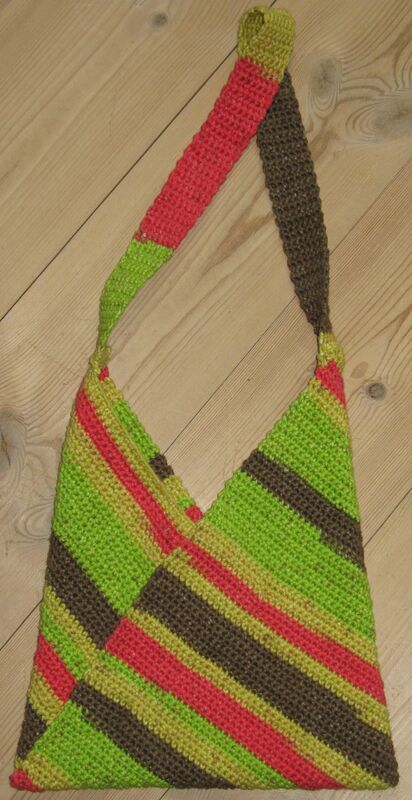 loves the colors combination u used on ur bags and thanks for sharing the masa bag pattern. it was easy to get the idea and will be making it soon. I’m confused at how to fold it. :( It look so cool too! If you try using the exact ratio paper (1:3- e.g. a piece of A4 will allow you to cut out a rectangle of 30cm x 10cm), and follow the folding exactly as the photos show, you will get the bag- basically the folding gives you the shape shown in the bottom photo- you then have to stitch from each corner up to the dots to make the 3D shape whole. The folding gives you the over all shape, but seaming has to occur, as the folding itself does not make a solid 3 D shape. The best thing to do is mess around with the exact ratio rectangle of paper until you get it- it will suddenly fall into place! Please either do a photo demo or typed walk through how to make the bag sit flush with the floor. Doing the patt right now @ 10 am. Expect to be done by 6 pm. Would like to give it to godchildrens mom, today. We’re in Europe, it’s a Saturday afternoon when you posted, when most people here are away from the internet. It’s 19.20 in the UK now, so we are already almost 5 hours from your post, and it’s unlikely that Lisa will see it or have time or resources to do what you have asked in that immediate time frame. I don’t crochet but I have made a knitted version of this bag by making a simple felted rectangle and folding it as above. Hopefully by now you will have fettled it yourself by now, but please feel free to ask again if you are still stuck, and I’ll try to help. The bag is flat when finished, and what makes it sit on the floor, is the weight of anything you put inside it. It won’t sit on the floor while empty, there is no horizontal base written into the pattern. You could try shaping a lozenge of stiffening fabric or something heavier, points at each end, maybe an elipse, something like that, which would fit into the bottom, but I prefer mine to lay flat when empty, it’s easier for storage. Hope that’s helpful to you. Thanks for your quick response. Found the perfect color for this bag, and the mommy likes it. So I’m starting over from scratch. Not sure you understood what I was inquiring in reference to. So I’ll try again. On the pattern page it states something to the liking of “pinning in place” for the corners. If you could skim back through it I believe you’d understand what I’m asking about. Or maybe it’s already there and through not yet completing it- I can’t see it! Then again, morning has to come for you to see the sunrise, right? It’s a hdc/htc process. Long and lengthy. Yet I keep pushing so that I can send you lovely people overseas pics of the beauty you’ve inspired me to crochet. Can’t wait to finish. Huge hugs and thanks, again. Dee, basically, you make a rectangle, and that can be of any fabric, knitted or woven or crocheted, and then fold it as per the instructions above. If you have a specific question, I will certainly try to answer. I got the size correct and the length is 3 times the width but I ended up with a bag hardly big enough to put a wallet in. Is it suppossed to be this small? The photos made it look large and I wanted it for a beach bag. Are you sure it is 20cm wide? That is only 8 inches! Please help me as my vacation is the middle of August! My version of the Masa bag is actually quite small. To find out how wide you need yours try folding a large scarf or a large piece of paper. For a beach bag I’d guess around 40 or 50 cm wide would be fine. If you look where the word dots, (then comma) this sentence is NOT complete…what is the rest of the directions here see below, I have copied and pasted the sentence —what dots?? ?seam to where??? @krestiekrew Please look at the small square picture above – fold your piece like the paper in the picture – the dots are one the paper! Is the yarn you used like what is used for .. say like.. dishrags? Can this be crocheted with a worsted weight yarn?. It’s a very nice and funny bag: congratulations. However, looking at the picture the bag seems 3D, while following the instructions it is flat. Indeed in the picture one corner is overlapped so to form a squared base to stand up. Is there any different kind of expedient in order to have the same form of the bag? Love the colours! Have tried the paper version and now all I have to do is raid the stash! Got some fab mercerised cotton in coral, aqua, purple & stone which I’m earmarking for it. Sounds icky but trust me, they look better together than first imagined! Thank you for your pattern; will blog about making it, if that’s ok? Am I understanding correctly on measurements….if the width is 12 1/4″ wide the length should be 36 3/4. Thank you! I couldn’t figure out how to fold this and neither could my husband, so I’m off to YouTube to hopefully find a video for help. Would love to make this bag, but can’t figure out the folding. Someone please help – how about a tutorial?!? I’ve made a couple of these bags. They work well with a variegated yarn. I crocheted this bag in Elle Cotton On, turned out bigger than I expected, I also added a popper to keep it closed and a big button . Turned out great. Thank you. thank you!!!!! i ill make it!! !